What's your default search engine? 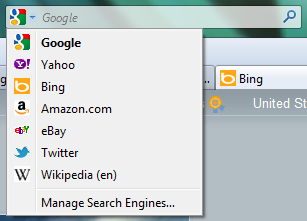 Firefox and Chrome automatically use Google as the default search provider, and Internet Explorer uses Bing by default. If you don't like the current default, however, changing the default so that you can use the search provider you prefer takes less than 60 seconds. The instructions below apply to the latest versions of these browsers; what you see may differ if your browser isn’t up-to-date. 1. Click the icon of your current default search engine on the left side of the search toolbar. Click the icon of your desired search engine on the left side of the browser toolbar. 2. Select a search provider from the drop-down list. The one you choose instantly becomes your new default. If you click Manage Search Engines… in the drop-down list, you can rearrange and delete entries from the existing list. You can also find additional search engines. 1. Click the Get more search engines… link. 2. Browse or search for the provider you want to add. When you find it, click its +Add to Firefox button. 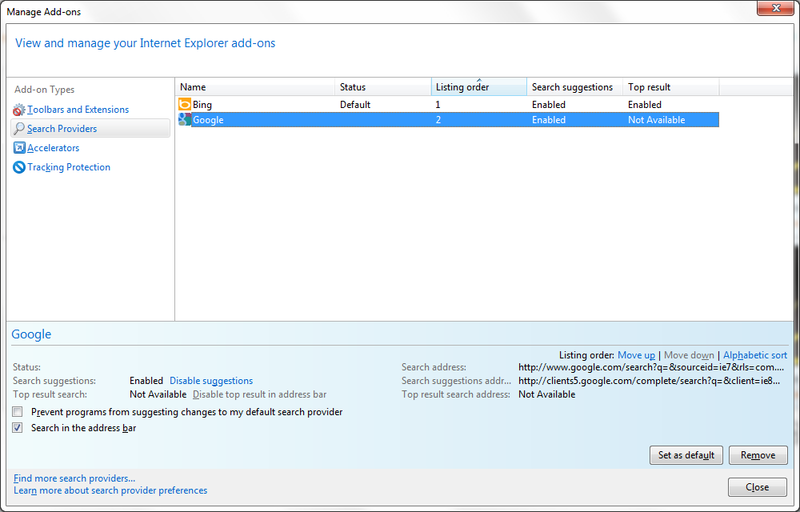 In the Manage Add-ons menu in Internet Explorer, select the Search Providers add-on type. 4. Click the name of the search provider you’d like to make the default, and then click the Set as default button in the bottom right. 1. Click the wrench icon in the top-right corner of Chrome. 3. Click Basics in the left pane, and then choose a search provider from the drop-down list next to 'Search'. Select the 'Manage search engines' option in Google Chrome to add new search providers. 1. To add Amazon.com as a search provider, visit Amazon’s website and search for something. 2. Click the wrench icon, and navigate to Options, Basics, Manage search engines… to see Amazon.com listed under 'Other search engines'. Hover over its entry, and click Make default. Having Trouble Changing the Default Search Engine? If you are looking for advice because your browser’s default search engine has recently and unexpectedly changed--and if you have also noticed a new toolbar or home page, perhaps, or an onslaught of pop-ups--your browser may have been hijacked by malicious software. If this is the case, you probably won’t be able to change your default search provider using the above instructions. You should immediately scan for and remove malware from your PC, and then revisit this article.